The word “turbocharged” is often used colloquially to describe increased speed, such as “turbocharged” coffee that energizes you faster than a regular cup of joe. Actual turbochargers also increase speed, but in combustion engines instead of your morning mug. Turbochargers operate via turbine-driven forced induction and often rely on hydrodynamic bearings for support. However, these bearings naturally include cross-bearing forces that cause negative damping and system failure. 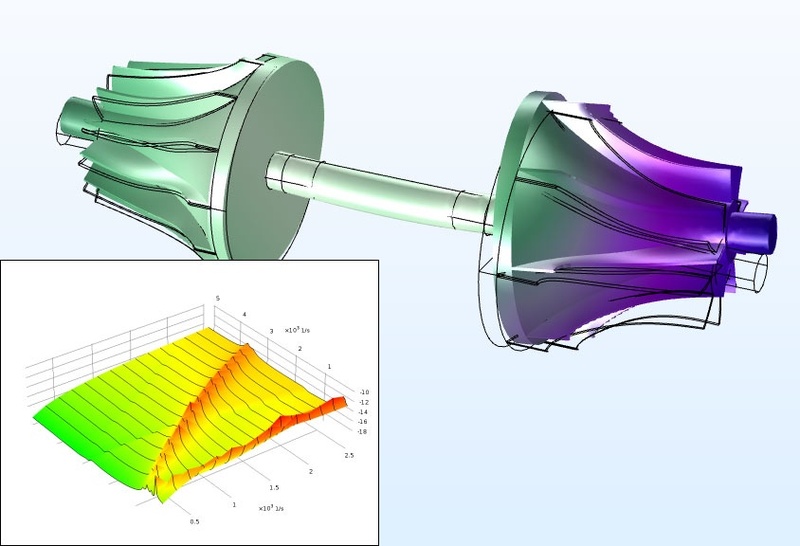 Using rotordynamics modeling, you can analyze how these forces affect turbocharger designs. Turbochargers increase efficiency and power generation in combustion engines by forcing extra air into the engine’s combustion chamber. These devices are commonly used in our basic modes of transportation, such as cars (both gas-powered and diesel) and motorcycles, and are also found in more large-scale applications, such as trains, ships, aircraft, and spacecraft. 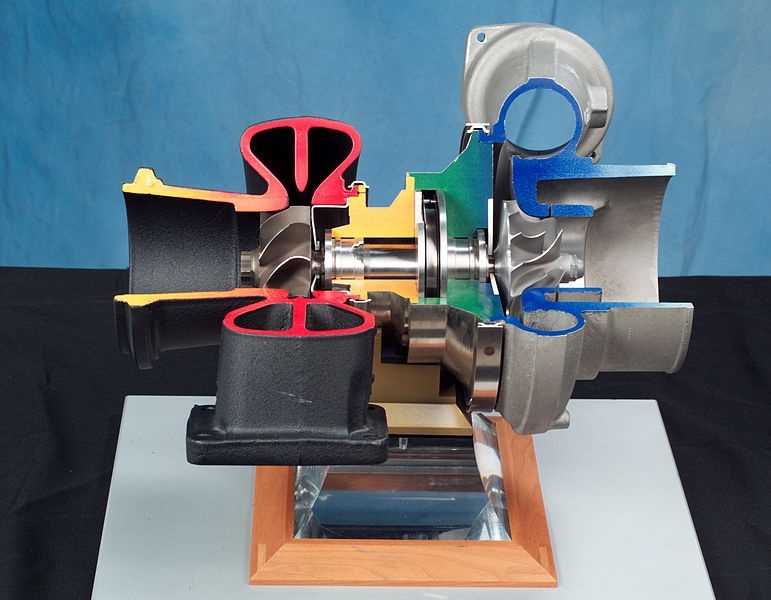 Cutaway view of a turbocharger used for aerospace propulsion. Image by Quentin Schwinn (NASA) and in the public domain in the United States via Wikimedia Commons. 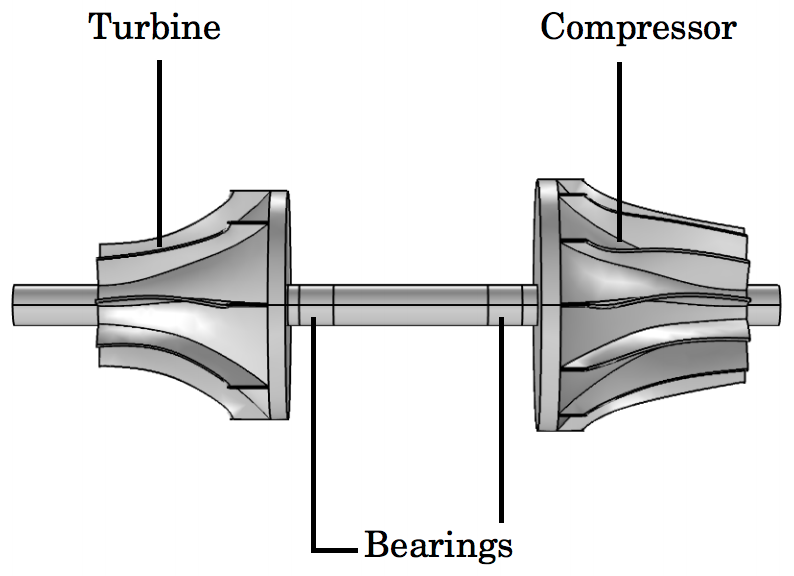 The hydrodynamic bearings used to support turbochargers in an engine system often include cross-coupled forces that cause negative damping in the rotor. This increases the risk of bearing failure, and in effect, failure of the entire system. When the turbocharger in a vehicle’s engine fails, it can cause the car to catch fire. To design a turbocharger that operates successfully, you can perform a rotordynamics analysis using the Rotordynamics Module, an add-on to the Structural Mechanics Module and the COMSOL Multiphysics® software. The Rotordynamics Module includes specialized features for this modeling scenario, which makes it easy for you to set up the model geometry as well as the physics and study settings. Two rotordynamics studies of the turbocharger model. The results from these studies give you insight into a turbocharger’s design and operating conditions, such as the angular speed and damping. The first study computes the eigenfrequency for the turbocharger at different angular speeds. 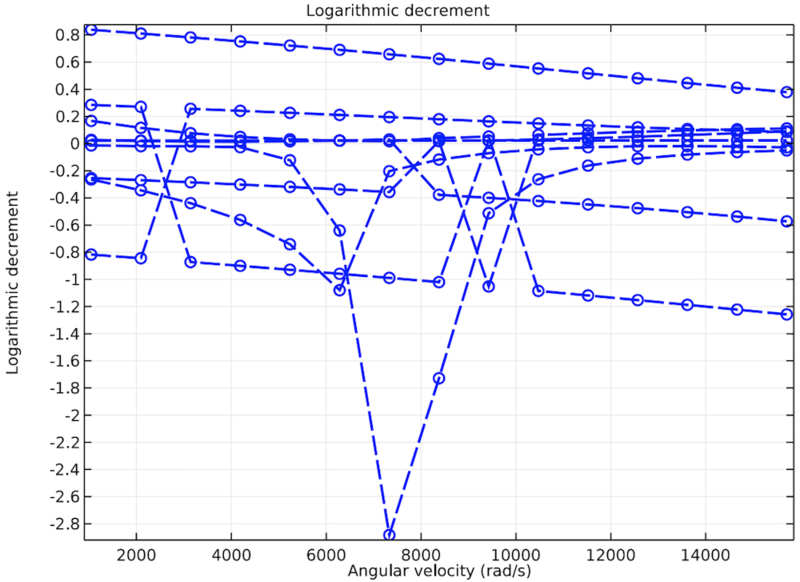 A notable result here is the logarithmic decrement, a value used to determine the stability of the rotor system. 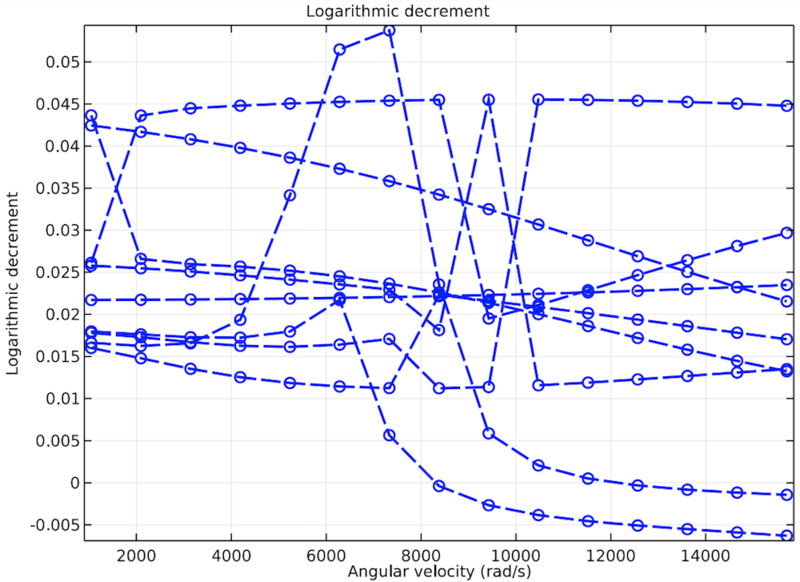 If the logarithmic decrement is positive, then the system is considered stable. A negative value means the system is unstable, while a value of zero means that there is no damping in the mode. Plots of the logarithmic decrement for the turbocharger model without (left) and with (right) cross-coupled stiffness. The logarithmic decrement of the turbocharger has mostly negative values after including the cross-coupled stiffness terms for the bearing. This means that stable vibration modes in the presence of cross-coupled stiffness become unstable — and that it is dangerous to operate the turbocharger at the tested speeds. 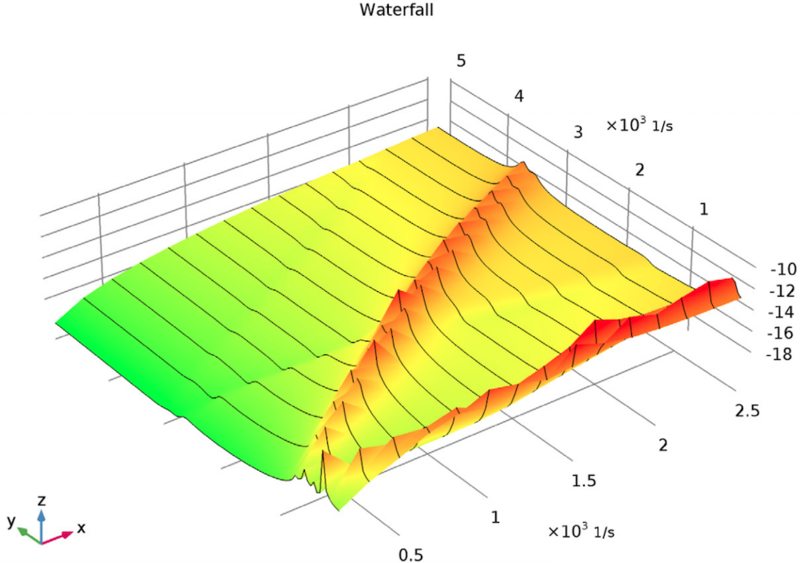 For the results of the frequency response study, you can generate Waterfall plots that show how the frequency spectrum of the rotor varies with the different angular speeds. Again, the responses of the turbocharger with and without the cross-coupling forces are compared. 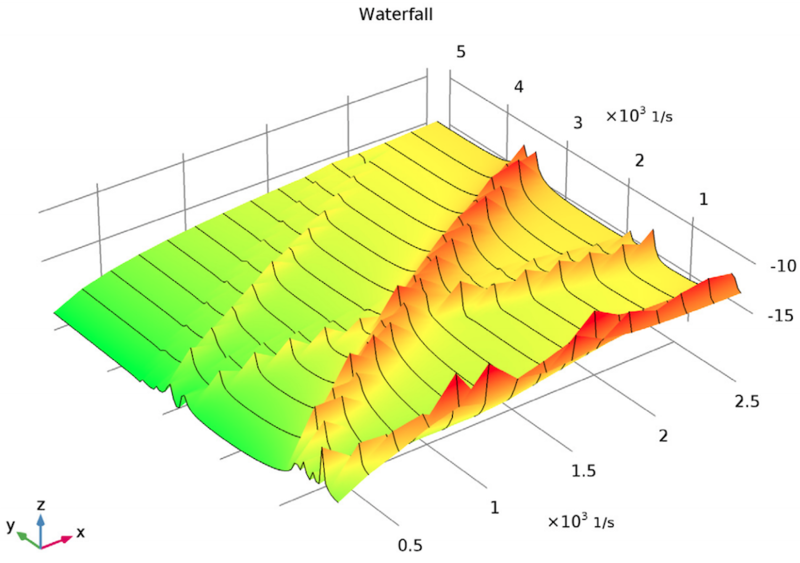 Waterfall plots for the turbocharger model without (left) and with (right) cross-coupled stiffness. Due to the eccentricity in the turbine and compressor in the turbocharger without cross-coupled stiffness, many modes are excited, as shown in the figure above. However, for the turbocharger with stiffness, not all of the modes are excited. This result implies that some of the modes that were excited in the absence of the cross-coupled stiffness due to eccentricity in the turbine and compressors are no longer excited in the presence of the stiffness. Therefore, a different combination of loading might be required to excite these modes in the presence of cross-coupled stiffness. Try analyzing how cross-coupled bearing forces impact the operation of a turbocharger: Click the button below to get to the Application Gallery, where you can download a step-by-step tutorial and the accompanying MPH-file (with a COMSOL Access account and valid software license).